Abstract. The formation of ice in clouds can initiate precipitation and influence a cloud's reflectivity and lifetime, affecting climate to a highly uncertain degree. 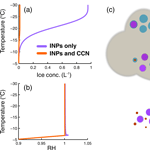 Nucleation of ice at elevated temperatures requires an ice nucleating particle (INP), which results in so-called heterogeneous freezing. Previously reported measurements for the ability of a particle to nucleate ice have been made in the absence of other aerosol which will act as cloud condensation nuclei (CCN) and are ubiquitous in the atmosphere. 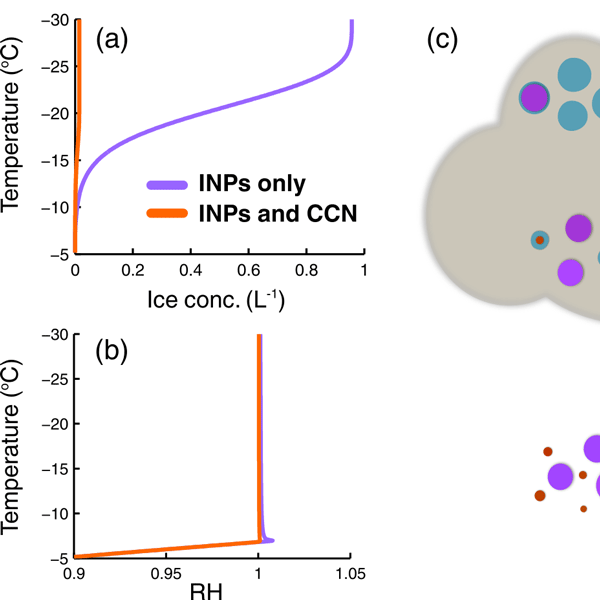 Here we show that CCN can outcompete INPs for available water vapour thus suppressing ice formation, which has the potential to significantly affect the Earth's radiation budget. The magnitude of this suppression is shown to be dependent on the mass of condensed water required for freezing. Here we show that ice formation in a state-of-the-art cloud parcel model is strongly dependent on the criteria for heterogeneous freezing selected from those previously hypothesised. We have developed an alternative criteria which agrees well with observations from cloud chamber experiments. This study demonstrates the dominant role that competition for water vapour can play in ice formation, highlighting both a need for clarity in the requirements for heterogeneous freezing and for measurements under atmospherically appropriate conditions. How to cite: Simpson, E. L., Connolly, P. J., and McFiggans, G.: Competition for water vapour results in suppression of ice formation in mixed-phase clouds, Atmos. Chem. Phys., 18, 7237-7250, https://doi.org/10.5194/acp-18-7237-2018, 2018. This study explores the process of ice formation in clouds by conducting computer model simulations and laboratory experiments in a cloud chamber. We show that the formation of ice in clouds can be limited by the presence of atmospheric aerosol particles and that further research is required to identify the requirements for freezing, e.g. minimum mass of water, in order to accurately calculate ice formation and thus improve climate and weather prediction.